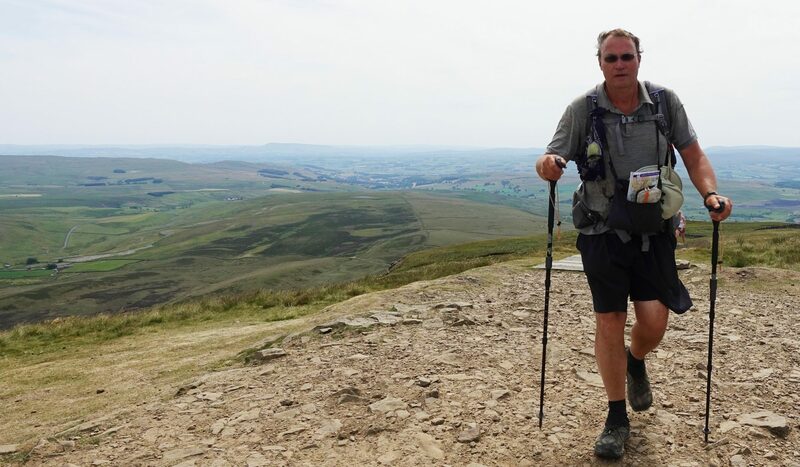 Three Points of the Compass carries an android mobile phone while hiking. This does everything I want it to do. This includes playing mp3 files, it has a radio and (fairly) decent speaker. But using it for music does eat into the battery. 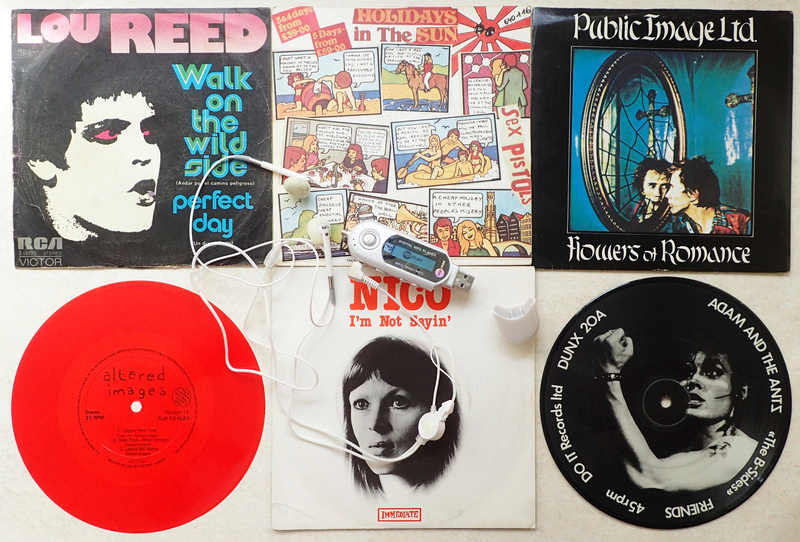 So, do I still carry an ‘old school’ music player on hikes? Thankfully I no longer have to contend with my Sony Walkman in the outdoors. It was an exciting piece of kit in its time, at last, we could take our music out with us, no longer relying on radio alone and actually being able to afford one of these players. But, never mind the case itself, what about all the tapes that had to be carried along too? How many recall the hours spent making up ‘mix-tapes’ to share around? 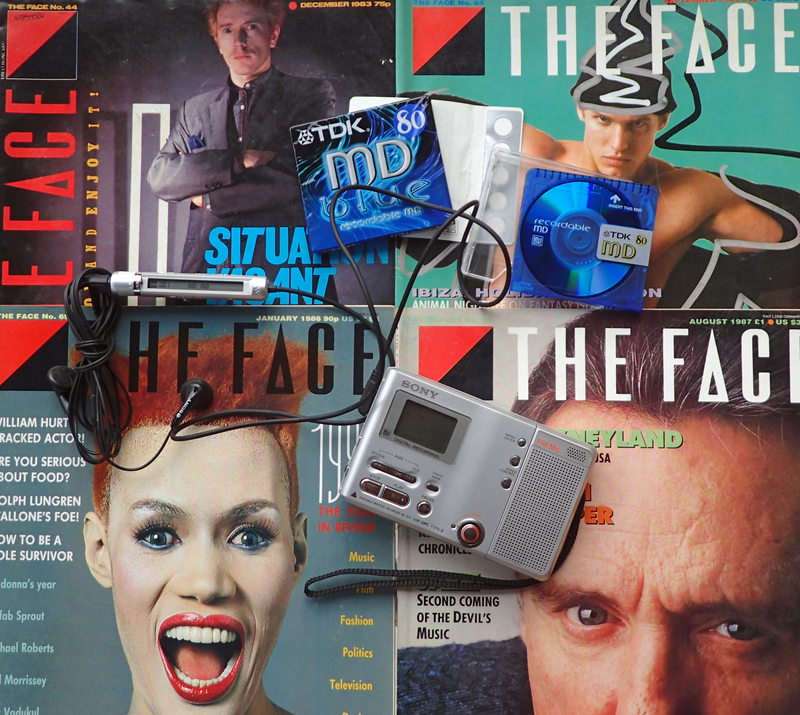 My model shown below was the Walkman FM/AM Radio Cassette Player WM-FX277, released in 2001. It operated on two AA 1.5v batteries. The daft little headphone that came with it has not survived the years, the thin foam covering to the ear pieces was never that robust. With batteries and a tape installed, and a simple pair of replacement ear buds, it weighs 248g without the horrible pouch that it came supplied with. My Sony Walkman from a good few years ago. The combined tape player/radio was quite a bulky item and could not fit into a pocket. The rather horrible plastic wallet with belt clip was a necessity when walking anywhere without a pack. There were few people, myself included, that didn’t also use the rather naff clip on belt pouch. Technology had to catch up with us as none of us really liked having this thing dangling by our side, complete with trailing headphone lead. Each tape weighed around 32g without its plastic case. Following on in the wake of my Walkman was my Discman for playing Compact Discs. Sadly, my Sony Discman never survived the years. To be honest, I was never the greatest fan of it as it skated terribly if jolted, so it ended up rarely leaving the house. ‘Jog-proof’ models followed but I never trusted them enough to buy one. 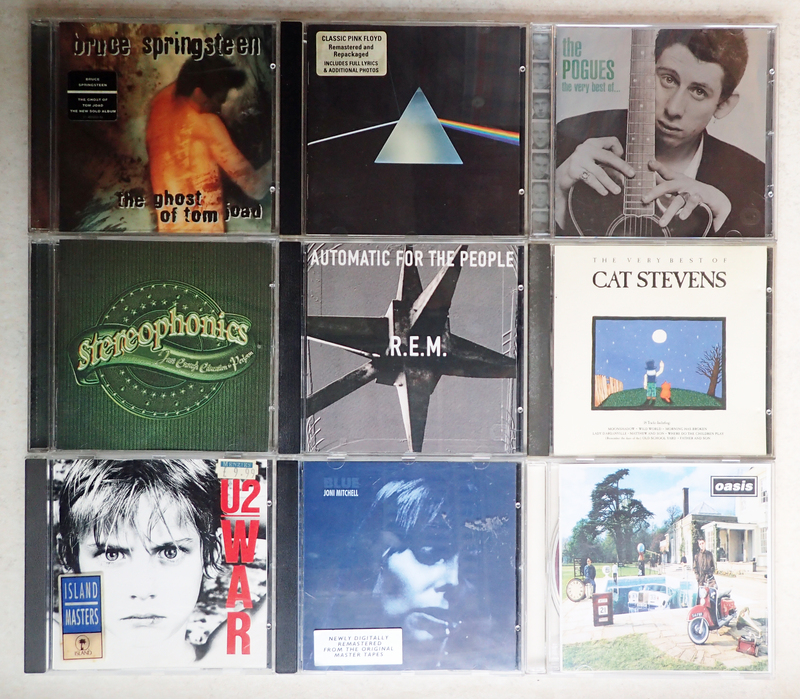 Each CD weighed 15g outside its plastic case. I was pleased when my next step-change in portable music came along. Sony announced the MiniDisc medium in 1991 and the first player was released just a couple of years later. Digital sound quality was good, and the storage space on each disc superior to the CDs that came before with up to 80 minutes. 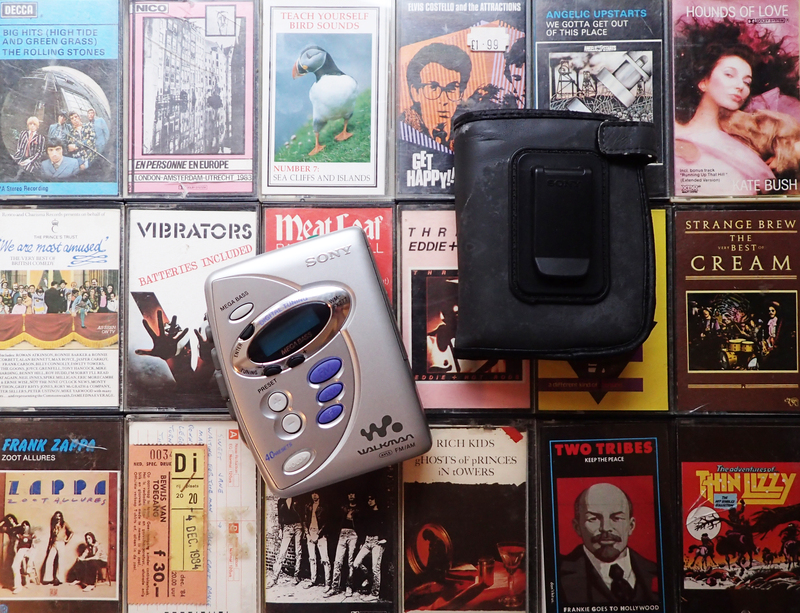 However, it wasn’t to be- Sony and technology generally, and the public specifically, gave up on MiniDisc players after just a few years. Sony ceased manufacture in 2013. A shame really, as my next big step saw not only a marked improvement in player memory, size and convenience, but also a drop in sound quality, though I suppose I have come to accept it these days. The World’s first commercially released personal digital mp3 player was the MP Man F10, released in March 1998, it had a 32MB memory and held around eight songs. By the time I purchased my MP Man MP-Ki (MP-FUB26) in, I think, 2004, it held an ‘awe-inspiring’ 128MB. At last, I was able to transfer more than just a few of my vinyl collection to digital files and take the music out with me. The little player, played for well over a day on one tiny AAA battery, could be plugged straight into my PCs USB outlet, no messing about with leads necessary. My little MP Man player weighs 58g with a 1.5v AAA battery installed, including a set of 17g buds. My one surviving early mp3 player- the little MP-Ki 128 from MP Man. Despite having a dire memory, this was actually a pretty good piece of kit, running, seemingly for ever, off of a single AAA battery. Once the end cap was removed, it could be plugged directly into a computer. 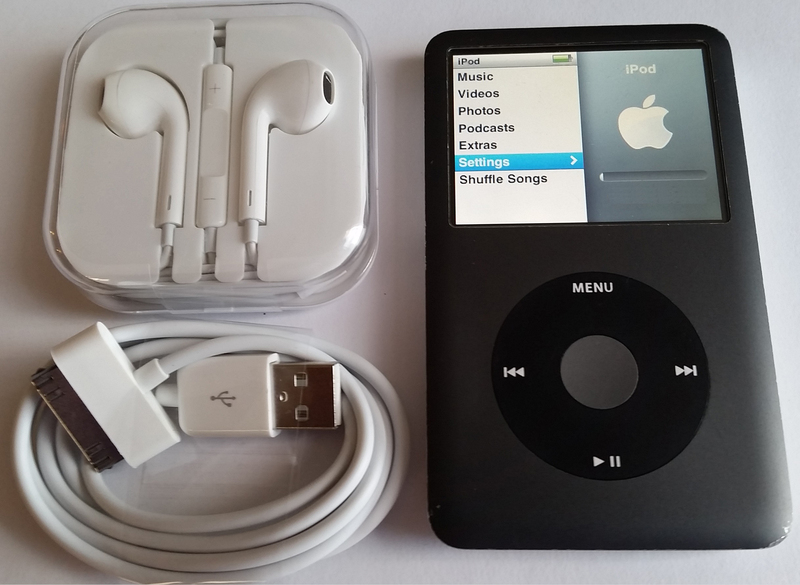 I now use a 7th generation Apple iPod Nano with 2.5″ multi-touch screen and 16 GB flash memory. This, in theory at least, gives me storage for up to 4000 music tracks, but I have it stuffed with a few seventies concept albums and various podcasts so am quite a bit under that number. But still, on a full charge, the battery supposedly gives almost 30 hours of playback, though I reckon I actually get far less than that. On the tiny screen there is also 720 x 576 video playback (3.5 hours of playback on a full charge) and I have occasionally uploaded a film or two to watch, but again, that eats into the memory. 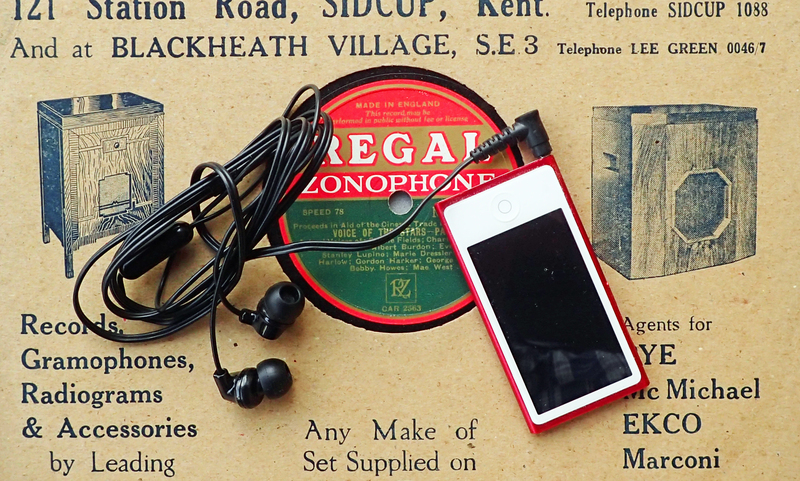 Though much larger than a 12.5g iPod Shuffle, this really is a tiny little player. However a Shuffle has no screen and is more awkward in track selection. Much of my iPod Nano’s 31.5g weight (with no buds) is down to a metal body construction. The FM Radio on the Nano has always worked well for me and I tend to use this feature most frequently while commuting, though it does require wired buds to work. I never use the integrated pedometer as I don’t believe it. Apple have now discontinued production of the Nano and just about every other mp3 player they have produced too, though the iPod Touch is still available as I write this page (autumn 2017). A decent memory on those but simply too large for me to consider. For the trail, I have stepped away from Apple products with the little SanDisk Clip Jam. This has a plastic body and only weighs 23.3g without buds, plus another 11g for the SanDisk buds or 14g for my usual Sony/JVCearbuds. So normally, it weighs less than 38g and I can charge it with a USB/Micro USB cable I already have with me for charging other devices. This cannot sync with iTunes but can be plugged into my PC via USB and ‘drag and drop’ music to either its 8GB internal memory of up 64GB micro SDHC memory card. The Jam has an internal battery and provides up to 18 hours playback. Again, like the iPod, the Jam supports various media formats- mp3, WMA (no DRM), AAC (DRM free iTunes), WAV and audible DRM. 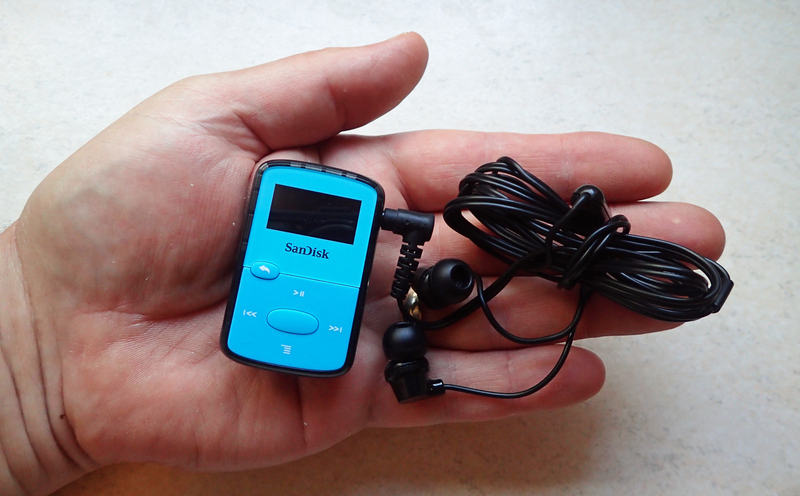 With this little player, I can listen to up to 2000 tracks, and load more on to another memory card, listen to FM radio, audiobooks and podcasts. 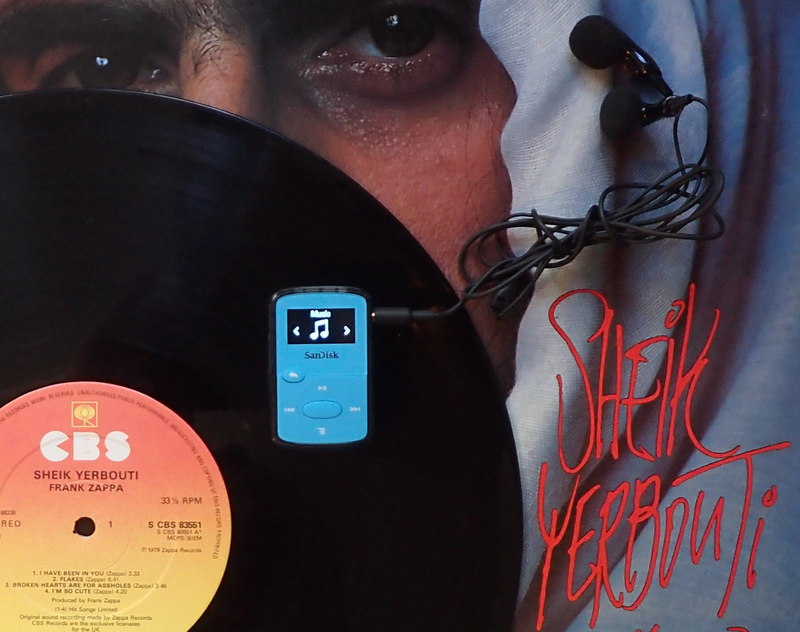 The weight of a little music player is tiny today. Using buds, I can get many hours a day usage before it has to be charged up. Of course I can also listen to music on my phone, but doing so risks flattening the battery that may be required for more pressing or even urgent business. I don’t actually tend to walk while wearing buds and listening to music. I prefer to have my wits about me, listening for people behind or in front, a cycle or horse approaching from behind on mixed use paths (or, God forbid, a motorbike on a By Road). I also want to integrate myself with my surroundings, listen to the birds, the animals, the wind, the path beneath my feet. Music, podcasts, films, the mountain weather service, those are for camp.